Considered by many to be the founding father of 20th-century Mexican music, Manuel Ponce dedicated himself to composing for guitar after meeting Andrés Segovia in 1923. 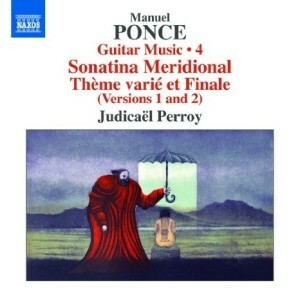 The evocative and warmly lyrical Sonatina Meridional is his response to Segovia’s request for a work “of a purely Spanish character.” The two versions of Thème varié et Finale with their inspired harmonic progressions are recorded together here for the first time, as is one of Ponce’s most expressive pieces, the Andante from a manuscript lost during the Spanish Civil War. Variations on a Theme of Cabezón was his final work for guitar. The Andante from Ponceʼs Sonata II remains as a fragment from a lost manuscript and this is the first ever recording of the work. Segovia mentioned the existence of an A minor Sonata in two letters of 1926. But in a letter of 26th August, 1939, Segovia refers to the loss of this and other pieces from his ransacked Barcelona apartment during the Spanish Civil War. A copy of the Andante, however, was fortunately discovered by the eminent Italian guitarist, scholar, and editor, Angelo Gilardino, who forwarded a copy to Judicaël Perroy for this recording. Perroy’s playing on this album is excellent. He has unique style of extroverted performance with a clear and woody sound. He has risky virtuosic chops to spare and his musical intentions are always crystal clear. Also, when he plays softer with a more intimate character the contrast is large but very pleasing. Not many guitarist’s could get away with Perroy’s individual style but he pulls it off beautifully. I love how he pushes the instrument, and plays out as if performing in a big concert hall. Because of his aggressive style you can hear some squeaks etc but I like hearing the guitar played and not coddled for the recording. Another highlight of the album is hearing how Perroy creates massive contrast in mood and articulation between variations. Even if (for some weird reason) his style is not your cup of tea, he is no doubt one of the great guitarist of our day. Recording quality is great as we usually expect from Naxos. The more live sound (as if one was listening from the audience) is not as common these days but I still prefer it to close mic studio recordings. Conclusion: From extroverted virtuosity to intimate melodic playing, Judicaël Perroy delivers some of the best performances of Ponce’s music. The strong melodic element, rhythmic excitement, and beautiful harmonies make this music some of the best in the guitar repertoire. 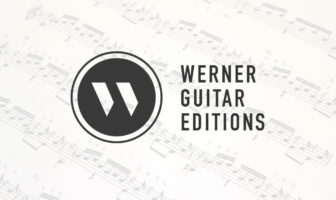 Guitarists and general listerners will love hearing the massive Variations sur ‘Folia de España et Fugue’ and everyone can enjoy the simple and touching Variations on a Theme of Cabezón, Ponce’s final work for guitar. The two versions of Thème varié et Finale also make for an interesting comparison. Everyone will want to hear the new Andante dalla Sonata II. This is a must-buy recording for 2016. Explain what you mean by a subscription. How much does it cost? What are the terms of the subscription?What is the subscription length of time for it to continue?